I feel like I’ve been seeing a lot of dystopion literature on the blogs that I read these days, and while I’m not one for science fiction, small doses are OK. Farenheit 451 and The Giver were two of my favorite books to teach when I was still in the classroom, and so I’ve been intrigued by the reviews I’ve been reading of Ninni Holmqvist’s debut novel, The Unit. In Holmqvist’s European society, people are either “needed” or “dispensable.” If you don’t have children and aren’t in a high-demand profession, you’re “dispensable” and sent to the unit to live when you reach age 50 (for women) or 60 (for men). There, you will donate your body to science, research and society – one element at a time or however it is you are needed. The unit (called a ‘luxury slaughterhouse’ by one character) is fitted with the best one could want for everyday living with restaurants, shops, state-of-the art gym, pools, sauna – even a park with a mini-version of Monet’s flower garden and water lily pond – all at the residents disposal. The main character, Dorrit – a writer, is glad to learn when she enters the unit that her first experiment will be one on exercise and the primary task is enjoyable – 5 hours of strenuous exercise 5 days a week. However, she knows that this harbor will come to an end, and that she, like her friends, will give her organs one at a time until her “final donation” when an organ necessary for life is needed for someone more worthy still in the “community” (the outside world). The dispensable unit dwellers are supposed to be comforted by the full disclosure of who will be the lucky recipient of their donation, and so the reader is never far from the question, “What about my life makes me valuable to society?” When Dorrit learns that her older sister, Siv, gave her final donation just a short time before Dorrit entered, she laments her personal ‘need’ for her sister, despite what society says mattered. With death looming and loss – in every increment – a daily burden and without the usual cumbersome details of everyday life, the residents of the unit are incredibly loving and supportive, forging friendships and romances that exceed anything experienced in the community. Dorrit, too, falls in love – with Johannes, a fellow writer – and when she becomes pregnant, her body gives her a new time line by which she must answer some ever-present questions. While in the unit Dorrit meets at least two staffers who sympathize with the residents, and the theme of guilt and responsibility – not unlike themes explored regarding guards in Holocaust literature – is exposed. Capitalism, freedom, loss, human value, desire, truth and family are just some of the themes that make The Unit ripe for discussion. Now, for the one flaw – which is maybe two, but they are closely linked. In the novel, Dorrit is a writer and this is ‘her story’ told in first person. She breaks the ‘fourth wall‘ a couple of times by speaking directly to her reader. And this maybe wouldn’t be so bad except that somewhere around 10 pages from the end, she tells you she’s lied to you and then never tells you the truth! Yes, she (the narrator) tells you that part of the story she’s told you was completely untrue – she’s “protecting” someone’s identity she says. Seriously? Give me a break. And I really don’t know what to do with this. But there it is. The unreliable narrator. 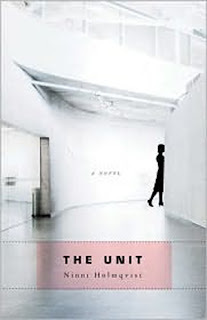 Regardless, The Unit is a most worthwhile read, and would make a fantastic choice for a book club selection. The unreliable narrator made me mad too! I didn't want to tell you before you read it because I didn't want to cloud your reading. Glad you enjoyed it! I'll definitely be adding this book to my list! @tiff – did it bother you that Dorrit spoke to the reader? Who do you think gave her the card? @Rebecca – do! And the you must let us know what you think! I can't find an email address for you, so please forgive me intruding on your comment wall. I’d like to invite you to write about your favorite books at http://www.bookdrum.com, where you can add information, images, video, music and links to illustrate and explore the books. As interesting as this book sounds to me, breaking the fourth wall pretty much always annoys me. But, the themes you outlined are compelling to me, so I'm adding it to my TBR. I'm especially interested in the theme of "what makes one valuable to society." That theme alone could occupy a person for a lifetime. I generally do not read sci-fi or fantasy either, but I would like to mention that Margaret Atwood’s The Blind Assassin was one book in which sci-fi really worked for me. In fact, as the story progressed, I found the sci-fi storyline was the one that most interested me. Stacie, yes, do read. The author's "errors" don't happen untill the end – so you can enjoy most of the book without them. I listened to The Blind Assassin on tape & enjoyed. Yes, another example of sci-fi in small doses makes it tolerable.